It’s almost time to start planting cool-season crops. These veggies can be planted in early spring as soon as the soil is dry enough to be worked with. How do you know when that is? Grab a handful of soil and squeeze it, then poke your finger into it. If it looks like a mud pie or falls apart in damp clumps, it’s too wet. But if it crumbles apart, soil conditions are perfect. Today’s topic is growing peas, but other cool-season crops include radishes, spinach, onions, carrots, parsnips, Swiss chard and lettuce. There are three types of peas: shelling, snap and edible pod, which are also known as snow peas. They all have the same cultural requirements. Some cultivars I’ve had good success with are Lincoln (Homesteader), Green Arrow, Little Marvel and Oregon Giant. 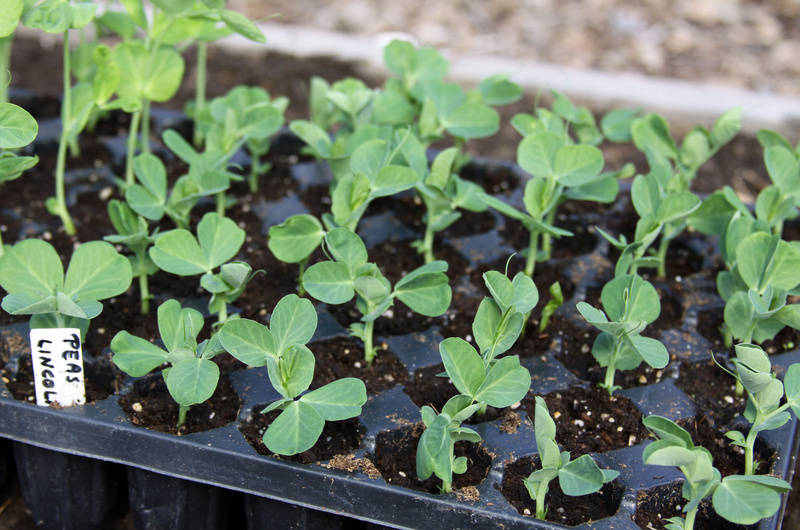 I start my peas indoors in mid-April for two important reasons: The birds that visit our garden love to devour freshly sprouted seeds, and if the weather is particularly cool and damp, pea seeds have a tendency to rot in the ground. By growing them indoors under controlled conditions, I get the best germination rate and get them past the delicate stage. Once the seedlings are about 3 inches tall, I transplant them into the garden. The nice thing about growing peas is that they can be crowded into a bed since they grow up rather than out. I space the plants about 2 inches apart. Frost is always a concern when planting early in the season. Because of this, I usually cover the seedlings with a floating row cover for the first week or two to give them a few extra degrees of protection. Floating row cover is a lightweight woven material that lets in air, light and moisture and keeps the plants growing under it a little warmer. This gives the seedlings a nice start. The covers can also be used as an insect barrier. Insects aren’t an issue with peas but vegetables in the cabbage family tend to get aphids and cabbage worms so the cover keeps them away from the plants. While peas are self-pollinating, keep in mind that you can’t leave a floating row cover on flowering plants that need to be pollinated in order to produce their fruit. This includes crops like tomatoes, peppers, melons, squash and eggplant. Most pea plants require some type of vertical support like a wire or nylon trellis or you can grow them along a fence. I’ve had great luck using two sheets of concrete-reinforcing wire that have been tied together at the top and spread apart at the base. Since most peas only grow from 2 to 4 feet in height, you won’t need a particularly tall trellis. Some pea varieties are known as bush peas because of their shorter vines. The seed packets indicate they won’t require any support but I’ve noticed they tend to fall over in a big clump, making harvesting tedious and challenging. I prefer to use a trellis. Here’s a little-known fact about peas: Did you know that the leaves on the vines taste just like the peas themselves? The tender, fresh growth makes a delicious addition to salads. Be sure to harvest your peas regularly so they will continue to bloom and develop new pods. Unfortunately, peas don’t like hot weather so once temperatures rise, the plants will stop producing. Chop up the vines and either turn them into the soil to provide future crops with nitrogen or add them to the compost pile. Susan Mulvihill can be reached via email at inthegarden@live.com. Visit her blog at susansinthegarden.blogspot.com for more gardening information, tips and events.